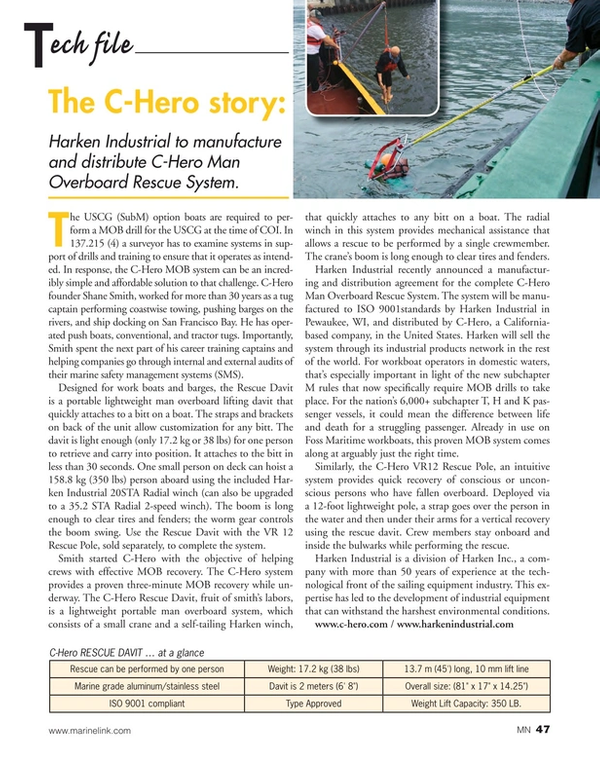 Harken Industrial to manufacture and distribute C-Hero Man Overboard Rescue System. The USCG (SubM) option boats are required to perform a MOB drill for the USCG at the time of COI. In 137.215 (4) a surveyor has to examine systems in support of drills and training to ensure that it operates as intended. In response, the C-Hero MOB system can be an incredibly simple and affordable solution to that challenge. C-Hero founder Shane Smith, worked for more than 30 years as a tug captain performing coastwise towing, pushing barges on the rivers, and ship docking on San Francisco Bay. He has operated push boats, conventional, and tractor tugs. Importantly, Smith spent the next part of his career training captains and helping companies go through internal and external audits of their marine safety management systems (SMS). Designed for work boats and barges, the Rescue Davit is a portable lightweight man overboard lifting davit that quickly attaches to a bitt on a boat. The straps and brackets on back of the unit allow customization for any bitt. The davit is light enough (only 17.2 kg or 38 lbs) for one person to retrieve and carry into position. It attaches to the bitt in less than 30 seconds. One small person on deck can hoist a 158.8 kg (350 lbs) person aboard using the included Harken Industrial 20STA Radial winch (can also be upgraded to a 35.2 STA Radial 2-speed winch). The boom is long enough to clear tires and fenders; the worm gear controls the boom swing. Use the Rescue Davit with the VR 12 Rescue Pole, sold separately, to complete the system. of a small crane and a self-tailing Harken winch, that quickly attaches to any bitt on a boat. The radial winch in this system provides mechanical assistance that allows a rescue to be performed by a single crewmember. The crane’s boom is long enough to clear tires and fenders. Weight Lift Capacity: 350 LB. Harken Industrial recently announced a manufacturing and distribution agreement for the complete C-Hero Man Overboard Rescue System. The system will be manufactured to ISO 9001standards by Harken Industrial in Pewaukee, WI, and distributed by C-Hero, a California-based company, in the United States. Harken will sell the system through its industrial products network in the rest of the world. For workboat operators in domestic waters, that’s especially important in light of the new subchapter M rules that now specifically require MOB drills to take place. For the nation’s 6,000+ subchapter T, H and K passenger vessels, it could mean the difference between life and death for a struggling passenger. Already in use on Foss Maritime workboats, this proven MOB system comes along at arguably just the right time. Similarly, the C-Hero VR12 Rescue Pole, an intuitive system provides quick recovery of conscious or unconscious persons who have fallen overboard. Deployed via a 12-foot lightweight pole, a strap goes over the person in the water and then under their arms for a vertical recovery using the rescue davit. Crew members stay onboard and inside the bulwarks while performing the rescue. Harken Industrial is a division of Harken Inc., a company with more than 50 years of experience at the technological front of the sailing equipment industry. This expertise has led to the development of industrial equipment that can withstand the harshest environmental conditions.